Is the sNCT/CPT exam an objective or subjective procedure? The Neurometer® CPT sNCT examination is an a objective test for quantifying the functional integrity of sensory nerve fibers. The sNCT/CPT procedure is based on the same objective paradigms used for evaluating hearing and vision. These methodologies are widely used, well characterized, and legally recognized. The CPT evaluation is a fully automated double blinded procedure, neither the device operator nor the subject is aware of the output parameters of the device during the testing procedure. Standardized fully automated CPT measures are obtained with resolution of +/- 20 μAmp., p<0.004. The following figure illustrates the difference between a subjective test such as the Visual How old Scale (VAS) and the objective Current Perception Threshold (CPT) in the evaluation of progressive radiculopathy. In the early stages there is hypoesthesia, neuritis and pain. In the advanced stages there is a loss of sensory function anesthesia and weakness. 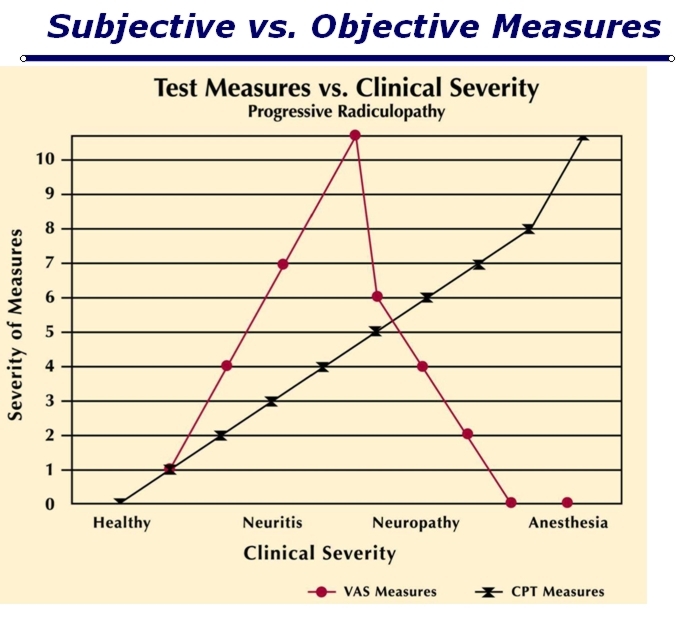 Consequently in the later stages the VAS pain evaluation measure can return to zero while the CPT becomes maximally elevated.